Custom Thanksgiving invitations for the Holidays. Modern and rustic Thanksgiving invitations for your annual or one-time gatherings to celebrate the Season of giving thanks. 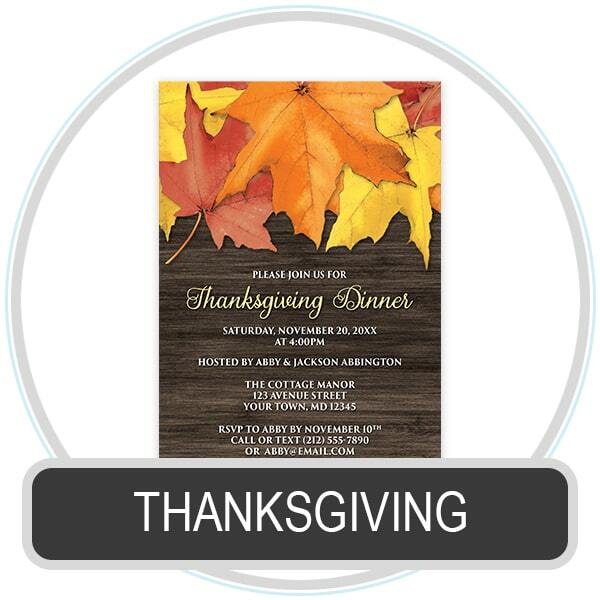 Use these invitations to invite your family and friends, or for corporate events, to celebrate Thanksgiving and for having Thanksgiving Dinner. Cater these invitations to your Holiday event, or dinner with friends and family, by providing the wording you need to fit your occasion. This wording can be different from the pictured example. You will be emailed a proof image for your review and approval before your Thanksgiving invitations are printed. This proofing process with the Designer is complimentary, and helps to ensure we get your invitations just as you want them.